Blurb: The goal may be to sell Mattel, but this is still 100% Shannon Hale. Review: I did have a concern going into this book, but it doesn't seem to be the same concern that most people had. In nearly every review I read I saw people saying "I was nervous about Shannon and Mattel working together." To which I say: ...why? For some reason I never had this worry. Yes, I knew that the goal of this book would be to sell the dolls, merchandise, etc. But I also felt pretty confident that Shannon wouldn't have agreed to any kind of book deal if she didn't know she could be true to her own writing. So no, that wasn't my concern. My concern was simply that this book was clearly targeted for the middle grade audience. Not only am I not a middle grader, I actually really dislike middle grade books (just personally, not in general). Both of these concerns were resolved by the same fact: This book was written by Shannon Hale. Despite the commercialism behind it, Shannon rocks out some awesome values. And despite the intended middle grade audience, the brilliant writing can make this appealing to all ages! I'll admit that I struggled through the first few chapters. It was just dripping with puns, and at first the use of the word "hex" was just too much for me: "hexcellent" "hextbook" "hexting" AHHHH!!! But eventually it became just like any other book that makes up its own lexicon, and I got used to it. After that happened I loved this book. There were so many subtle things that I'm not even sure a middle grader would get, but I got it and thought it was hilarious. There were even some sections (particularly when the narrator is addressed directly) where I could hear Shannon reading the book in my head. So yes, this book is meant for middle graders, but in the same way Disney movies are made for kids: most adults can still enjoy it if they embrace a little bit of silly. And I definitely noticed some awesome messages that Shannon had stuck into the book. There were several, but the main one that stuck out to me was how she portrayed the female body image. Yes nearly every princess in the book is described as being beautiful, but I can't remember one time a character was described as "skinny." One of the main characters puts her hands on her "broad" hips, and then later when called "plump" the character isn't bothered. And another character is positively described as having very strong legs (my favorite character in fact, guess who?). Now... I may be reading too much into this, but when I look at those dolls I see skinny waists, big eyes, and high heels. 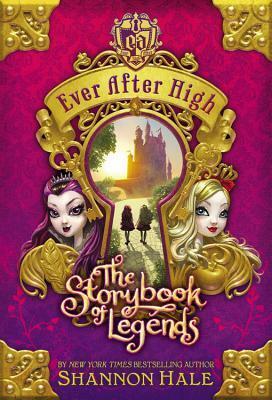 But when I read this book I see princesses that every girl can love and become. And whether or not Shannon consciously wrote this into the book, I LOVE it! In fact, I loved everything about it. Was it fluff? Hex yes! Fluff to the max! But what did Austenland teach us about froth and fluff? It's the best part! And honestly, I am just as excited for the sequel to this book as I am for some of her YA books. TBA (Loved it!) I can't find one of these on a blog! Just goodreads. Anyone know where I could find one? TBA (Didn't Like It.) Also couldn't find a blog with one of these. Instead I found a lot of GoodReads reviews that simply said "It was too fluffy and punny, I couldn't finish."